If you’re in the market for a new position, consider Doggy Dates dog walking jobs in MA. Since 2011, our company has provided premier dog care services in the Wellesley, Weston, Natick, Needham, Dover, Sherborn, and Wayland communities. With our company, you’ll have an opportunity to work away from the desk and with a group of fun-loving pups that head out to our one-acre fenced-in property for playdates, training, and more. We’re always looking for more playdate supervisors, overnight hosts, and dog care professionals interested in spending their days doing what they love most – hanging out with awesome dogs. You won’t find other dog walking jobs in MA that offer the same experience. Tell us why you fit the bill! In most doggy day care centers and dog walking businesses, employees or contractors spend time onsite at a certain location or around a client’s neighborhood. The dogs may or may not receive the attention, socialization, and experience they need to go home tired and happy at the end of the day. 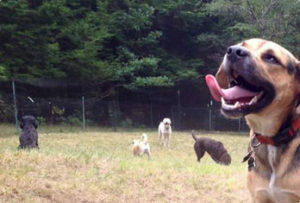 At Doggy Dates, our dog walking jobs in MA provide a much different experience. During a typical day, our team members host three group play sessions on our one-acre farm in the countryside. We shuttle all our furry guests from their homes to the site in our fleet of company-branded Scion XBs. Many of the dogs greet us as soon as we drive up, because they can’t wait for another playdate. These dog walking jobs in MA offer our employees a fun and changing experience from day to day. After a few hours of play on the property with a pack of other dogs, we load up the pups and take them back home. Any overnight guests go home with their hosts for extra love and care. When you join our company for dog walking jobs in MA, you get to do much more than walk the dogs. You get to play in an off-leash environment and build relationships with their owners every time you pick up or drop off their pups. Some of our group play supervisors even leave notes for owners to find at the end of a long day of work. At Doggy Dates, we currently provide three main areas of services for our clients – pet sitting and playdates, overnight care, and training. Our pet sitters, playdate supervisors, and overnight hosts handle a majority of the workload on a day-to-day basis. Since we provide end-to-end care services, our employees spend a great deal of time at the farm site and on the road. If you’re searching for dog walking jobs in MA, we will strive to place you in a position where you’ll thrive as part of our team. As a growing business, we’re constantly on the lookout for new talent to maintain high quality and one-of-a-kind experience. We’re searching for part-time dog sitters, full-time playdate supervisors, and other dog lovers with specialized skillsets. As the go-to business for dog walking jobs in MA, we look forward to hearing how new pet professionals can contribute to our value proposition. Strong reviews. Look at customer testimonials on the website as well as social media sites. If available, watch dog playtime videos and browse through the pictures of the dogs our company serves. You’ll quickly see the difference in customer experiences from place to place. Look for customers and dogs you can see yourself playing with and caring for on the job. Some dog walking jobs in MA may offer a more laid back and inviting experience than others do. Insurance and bonding. Professional businesses protect themselves and their customers from risk. Doggy Dates is bonded and insured for peace of mind. While we hope nothing ever happens to our dogs or our drivers, we’re prepared to handle any unforeseen circumstances. Look into the insurance status of any dog walking jobs in MA before applying. The right culture. For us, the experience of working with dogs and bringing joy to our clients’ lives makes the job worthwhile. We want all our employees to feel the same sense of satisfaction at the end of the workday. If we’re the right fit, everyone will enjoy a much better experience. Take your time and talk with employees before choosing between dog walking jobs in MA. Job searches are two-way streets. We offer an excellent hiring experience, and we can’t wait to see if you’re our next valued playdate supervisor. While most of our work is fun and play, we do perform several housekeeping tasks on a regular basis. As a bonded and insured business, we do conduct thorough screenings for all of our employees and provide on-the-job training for consistency in all our work. Whether you’ve been working in an unfulfilling field or you need to build the work experience in your resume, we hope you’ll consider Doggy Dates when you look for dog walking jobs in MA. The dog lovers who make up our current team come from a variety of backgrounds, but we all love dogs. We’ve grown up with dogs, helped at local shelters, and trained dogs to be their best selves. Dogs are our passion, and we’re constantly sharing pictures on Instagram and stories on Facebook. Our dog walking jobs in MA provide more than a steady paycheck. They offer a community and a learning environment for the great people we employ. Expand your network as you interact with our regular clients, uncover your passion, and build life skills. What more could you ask for from such a laid back, enjoyable environment? We think our arrangement is pretty great, and so does our current team of playdate supervisors and overnight hosts. To learn the inside scoop about dog walking jobs in MA, call Doggy Dates at (781) 801-2526.